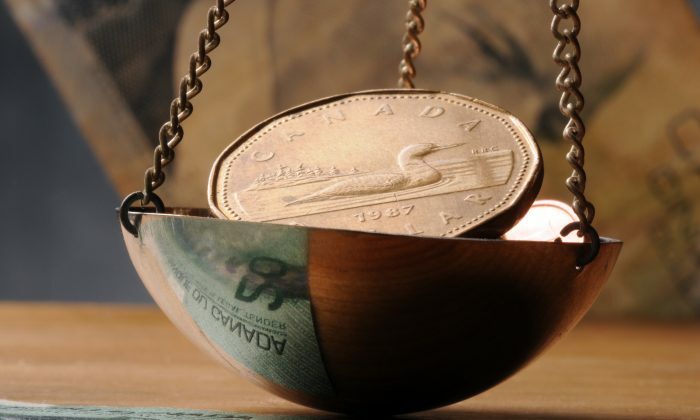 Canada is in a strong fiscal position at the federal level relative to other G7 countries, but its seemingly endless deficit spending and mounting total government debt should be throwing up red flags. 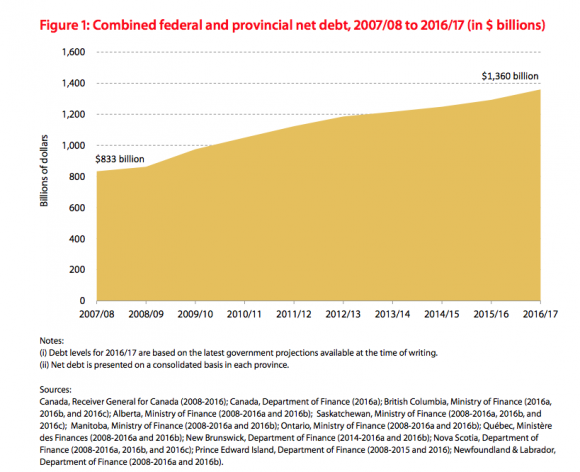 Federal and provincial debt in 2016–17 will reach a projected total of $1.4 trillion. This equals 67.5 percent of gross domestic product (GDP) or $37,476 for every man, woman, and child living in Canada, according to a bulletin from the Fraser Institute, a Canadian public policy and research think tank. “There are immediate costs to government debt and we shouldn’t be lulled into thinking that government debt doesn’t matter,” said Charles Lammam, the Fraser Institute’s director of fiscal studies, in a phone interview. Canada emerged from the financial crisis in better shape than its G7 counterparts partly due to being better prepared for it. Pre-crisis in 2007–08, total debt was 53 percent of GDP. In times of recession, governments may need to take on deficits to get the economy going again. But to be building up debt in a time of economic growth, albeit weak, is of concern to Lammam. It’s just about dealing with the problem now before things get really bad in the future. Also of concern is if historically low interest rates start rising. “You think about the next economic shock. … If we’re not in a sound fiscal position, we’re not going to be as prepared as we were heading into the last recession,” Lammam said. The federal government’s long-term fiscal projections show deficits until 2051. “There is no balanced budget plan in sight, so take those projections with a grain of salt. Our own analysis suggests that cumulative deficits will be much larger than what the government suggests,” said Lammam. The bulletin showed that interest payments on all government debt—federal, provincial, and municipal—in 2015–16 was $62.8 billion and cost roughly the same as spending on public primary and secondary education combined, which totalled $63.9 billion in 2013–14. That total debt-servicing cost works out to be 8.1 percent of the governments’ total revenue that year or $1,752 for each Canadian, or $7,009 for a family of four. There’s a strange contrast between perceptions of the federal government and Canadian households on indebtedness. According to Trading Economics, Canada’s household debt-to-GDP ratio of 99.8 percent ranks fifth highest in the world. Meanwhile, the International Monetary Fund (IMF) has lauded the Liberal government’s fiscal policy given Canada’s low federal government debt and borrowing costs. “Canada has the space for fiscal expansion to support the economy. In addition, IMF staff’s debt sustainability analyses do not suggest major concern about debt dynamics under different stress scenarios,” according to the IMF’s June 2016 survey on Canada. Governments have no choice but to pay interest on its debt, which takes funds away from social programs and infrastructure. Lammam points out two ways excessive debt can hinder the economy: Investors and households rein in their activity as they become uncertain about what government policies may be enacted, and there’s a greater risk of the government raising taxes to service the debt. Canada’s debt as a percentage of GDP peaked in 1995–96 at 99.6 percent. Lammam said governments need to take a lesson from history on how to balance the books. It involves scrutinizing spending and reforming the ways governments deliver programs, not just slashing spending. “It’s not like we’ve never done this before; it’s just about dealing with the problem now before things get really bad in the future,” he said. With respect to Ontario, the nation’s most populous province, Lammam and his team found that more than 70 percent of the new debt the provincial government has taken on since the financial crisis was to fund operating expenses, not infrastructure. “Similarly, if you look at the federal government and their plan for infrastructure, very little of the new debt is for infrastructure,” Lammam said. Lammam and colleague Hugh McIntyre stated in a November 2016 editorial that less than 10 percent of the infrastructure spending was going toward trade and transportation, which would boost the productive capacity of the economy. A lot rides on getting infrastructure right. It is the “main ingredient” in the Bank of Canada’s forecast, and should it disappoint, the central bank could be forced into cutting its key policy rate. One of the negative side effects of that would be to encourage consumers to take on even more debt.